Fig. 1 (A) Outline of an EST sequencing project. Note that the mRNA and cDNA molecules schematically depicted represent the population of all transcribed genes in the analyzed tissue. 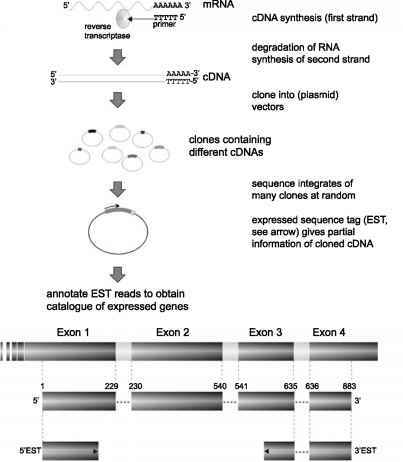 (B) Positional relationships of exons and introns on the genomic level, the complete cDNA derived from the mature mRNA transcript of the gene, and the partial cDNA sequence information (arrows) present in the 5' and 3' EST sequences. ESTAnnotator was designed for processing raw trace files (sequence chromatograms) or sequence text files. 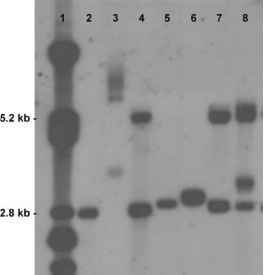 As EST sequences are generated by complex cDNA cloning procedures, they are often contaminated with vector and linker sequences. For generating high-quality input EST sequences, vector sequences and naturally occurring repetitive elements are masked by default. If too much sequence information is lost due to quality trimming or masking, no further analysis of the input sequence occurs and the task automatically stops. This was the case for about 2.6% of the EST reads in the cartilage EST project.